Most of them were eventually found but a support service has said organisations involved in search and rescue need to work together better. FIGURES FROM AN Garda Síochána show some 4,230 people have gone missing across the country since the start of this year. Most of them were eventually found but as of 20 June, 59 were still unaccounted for. 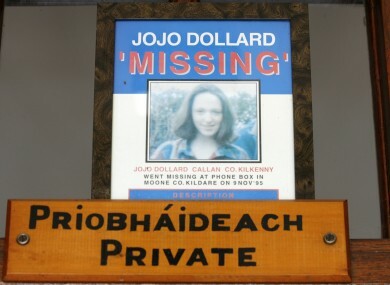 Speaking to TheJournal.ie, Dermot Browne, Chairperson at the Missing in Ireland Support Service (MISS), said his organisation has been trying to get additional information about missing people to gain an insight into the problem. Though the missing persons numbers usually average up to 8,000 a year, Browne said this includes the large number of children in care who go missing regularly for a few days at a time throughout the year. Browne pointed out that going missing is not a crime and “not everyone who has gone missing has a problem”. However there are “certain categories of people who there should be an immediate response for”. He referenced the case of 65-year-old Peggy Mangan whose body was found in Ballymun, Dublin, after she had been missing for a number of days. The elderly woman suffered from Alzheimers and had left her home in south Dublin with her dog but never returned. Browne said in cases such as this, where there is a serious concern for the person who has gone missing, searches need to be mobilised as quickly as possible. MISS is currently in the process of drawing a number of organisations that work in the area of search and rescue into a ‘missing persons alliance’ so that they are all working together when they are needed. It can take time once it’s reported to the gardaí to conduct a risk assessment – because it’s not against the law for someone to go missing – and then it likely goes to civil defence or mountain rescue or the Coast Guard. There are lots of local organisations that are just as well equipped to carry out a search and maybe more available and more quickly than an official organisation. He said the alliance will allow MISS to have a list of contacts to refer families to as they obviously want to take action but do not know where to go. In response to a recent parliamentary question asked by TD Bernard Durkan, Minister Frances Fitzgerald said she all incidents where a person has been reported missing “remain open and under investigation until such times as the person is located”. She said the garda authorities are satisfied that adequate resources are in place to deal with the issue and investigations are carried out in line with international best practice. Read: Why did all these Chinese ‘teens’ go missing in Ireland? Email “More than 4,000 people went missing in Ireland so far this year”. Feedback on “More than 4,000 people went missing in Ireland so far this year”.